I had read What Young India Wants and Revolution 2020 by Chetan Bhagat on my India visit this year. In fact, I have read all the books by the author, but, none of the reviews for those books have found their way into this space. One reason for that is that I had read them before I started this blog. When I read these two books by the author recently, I made sure that I write about it here. The name Chetan Bhagat evokes different reactions from different people. He is revered by many, he is idolized by many and even hated by many. I fall into none of these categories. I pick up his books when I am in the mood for an easy, fast read and Bhagat's book promises exactly that. In his latest book, What Young India Wants, Chetan Bhagat asks hard questions, demands answers and presents solutions for a better, more prosperous India. Why do our students regularly commit suicide? Why is there so much corruption in India? Can't our political parties ever work together? Does our vote make any difference at all? We love our India, but shouldn't some things be different? All of us have asked these questions at some time or the other. So does Chetan Bhagat, India's most loved writer, in What Young India Wants, his first book of non-fiction. 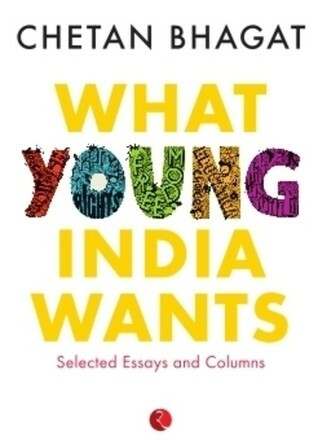 What Young India Wants is based on Chetan Bhagat's vast experience as a very successful writer and motivational speaker. In clear, simple prose, and with great insight, he analyses some of the complex issues facing modern India, offers solutions and invites discussion on them. And, at the end, he asks this important question: Unless we are all in agreement on what it is going to take to make our country better, how will things ever change? If you want to understand contemporary India, the problems that face it, and want to be a part of the solution, What Young India Wants is the book for you. When you pick Chetan Bhagat's book, you don't expect it to be a literary masterpiece. It is well known that his books doesn't fall under that category. This non fiction attempt by the author is not different either. The author has tried to address the main issues that are plaguing the Indian society - from the rampant corruption in Indian political system, ever increasing number of scams to the severe flaws in our education system -he talks about everything, gives his views and offers solutions. The chapters are short and to the point. He often gives examples and shares a story from his personal experience. But overall, the book lacks depth. There is an overview of all the problems without any detailed analysis. Even the solution offered are very general, simplistic and too shallow to be applied in the real world. The book will work like a crash course if you are preparing for debates and group discussions. On the brighter side, it can serve as a starting point for a much wider discussion and search for real and meaningful solutions to our nation's problem. Wordless Wednesday ~ Shades of Blue! Diwali Wishes| Recipes| Books update!